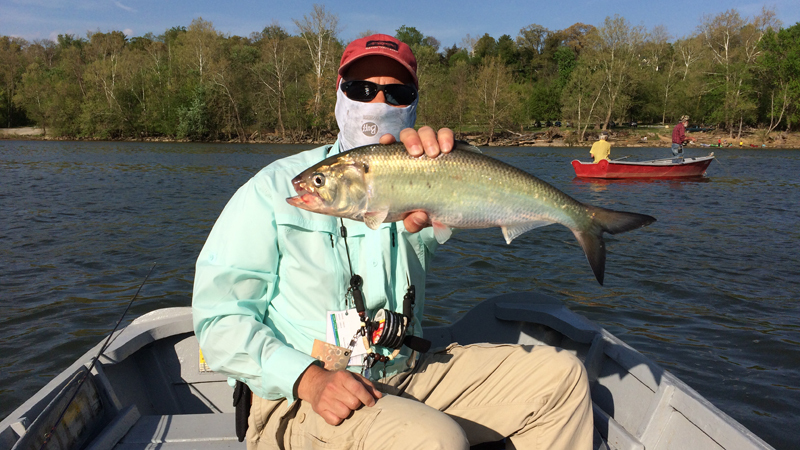 The weather was beautiful and PaulC, aka “Bass Master,” managed to secure a Fletcher’s rowboat and had spent most of his day fly fishing for shad on the Potomac River. He told me he had a seat waiting for me. As I pulled into the lower parking lot I saw him relaxing under a tree sipping a chilled beverage. He showed me his fish counter and it registered over 100. I was going to try my best to add to that total. We pulled out into the river and were soon anchored just outside a nice seam along the main current. We began to fish, but the action was really slow. The tide app showed that high tide had just crested, so I expected the fishing to pick up in about 20 to 30 minutes when the water started moving again. However another problem soon became evident. As we fished, we began hooking a few Hickories, but not in large numbers as PaulC had in the morning. A fish here. A fish there. Then long stretches of no nibbles at all. Then the wind began and so did our problems. It started off as a moderate gust blowing up river. A little strong at times but nothing we couldn’t handle. But soon it was blowing steadily and pushing the boat all over the river. When you are anchored outside Fletcher’s Cove, the current always has the rowboat’s stern facing downstream and the bow pointed towards Chain Bridge. But this wind was catching the slab sides of the boat and blowing it in circles around the anchor point, making it difficult to target the shad in their holding spots. I would hold my cast until the boat was beginning to swing toward the target area then place a cast so that the sinking line would be in position for the retrieve as we continued to drift. Most of the time it worked, but it slowed fishing down for me a lot. A couple of times I had my rod on one side of the boat and was hooking and fighting Hickories on the opposite side. And trying to haul them under the boat and not get fouled in the anchor rope as we continued to swing in circles was a pain. What we needed was a smaller anchor rock at the stern to keep the rowboat from swinging around the anchor line at the bow, but we didn’t have one so no use crying about it. We continued to fish and the wind continued to blow. We pulled in shad, but not in any crazy numbers. However at the end of the day I did my part and added to the final total of 142 shad.